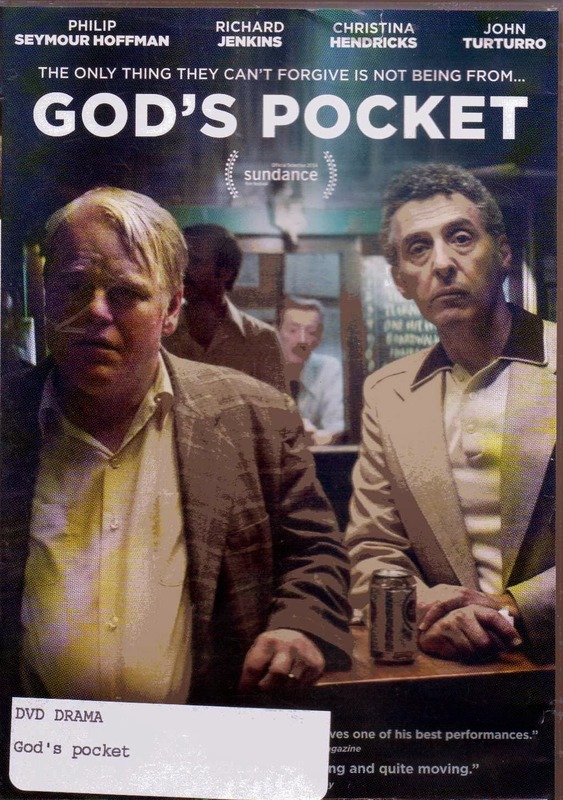 In his directorial debut, actor John Slattery has done a very competent job of conveying the lives of some very incompetent people living in the town of God’s Pocket, Pa. Perhaps incompetent is too harsh a word to describe the characters in this novel by Pete Dexter; and a screenplay by John Slattery. It’s more as if the people in this story are victims of the world around them; as well as themselves. Mickey Scarpato; played by Phillip Seymour Hoffman; is a man who dwells on the outskirts of the legitimate world. He has a legitimate business, but he is also willing to deal in stolen property; he respects his marriage, but realizes that the love he and his wife once felt is a thing of the past; and while he tries to look towards tomorrow, he is haunted by the events of yesterday and today. He is a walking contradiction. As if his life were not in enough of a downward spiral his stepson Leon Hubbard; played by Caleb Landry Jones; is killed by another “day worker” at the construction site where Leon was working. He was a drug addicted bully who was known to break into homes and steal to support his habit. Mickey has spent years trying to ignore the boy’s shortcomings in deference to his wife Jeanie; played by Christina Hendricks; who adores the boy. But this time Leon has picked on an elderly African-American man who kills him; in front of the whole construction crew; after the young man tried to cut his throat with a knife. When the police arrive, no one tells the truth about how his head got caved in. They all swear it was an accident with a piece of equipment which caused the fatal head injury. Jeanie is utterly destroyed; the people at the local bar all swear it’s a tragedy; but Mickey knows better. Meantime, while arranging the funeral for Leon he manages to lose his money on a race and can’t pay the undertaker. He bullies the man into providing the service on credit. But the real corker in this film is the relationship which Jeanie forms with a local news reporter named Richard Shellburn; played by Richard Jenkins. He is an alcoholic; washed out and prone to having affairs with young interns with whom he cannot perform well. When he is told by his editor to find a good story or a new job he quickly jumps on the local rumor of Leon’s death as being of a suspicious nature. This puts him into close and intimate contact with Jeanie as she struggles with the death of her son, as well as the failure of her own marriage, and it isn’t too long before they each find comfort with the other. The reviewers all hailed this as a “dark, brash, black comedy”, but I see it in a much different light. This is a sad, but unfortunately somewhat true story; more so than most of us would care to admit. Many people struggle to find their place in society; through school, work, and raising families. Those are the lucky ones. They get to play the game. This story concerns itself with the ones who don’t quite fit in and how they attempt to get along in a game they either don’t understand; or would rather not play, but have no other options available. What do you do when it’s the only game in town?